Finally, Wicked is here at Singapore. For those who strangely have no idea what I’m talking about, this is a hit Broadway musical that I have never expected to watch in Singapore. 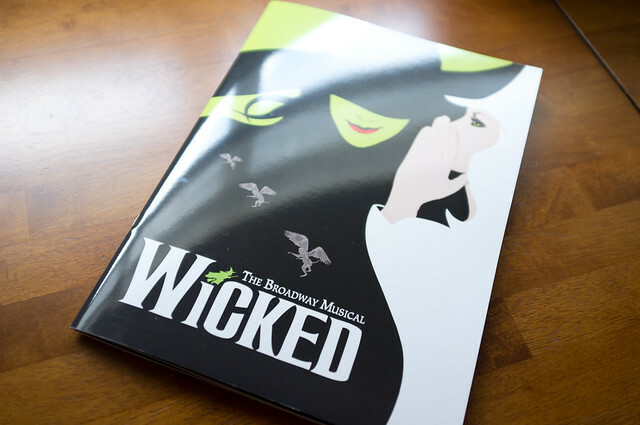 I have no idea who first introduced Wicked to me, but over the years, I have collected almost all cast recordings, read the original novel by Gregory Maguire and “watched” some performances with video recordings. This musical is shows the other side of “The Wizard of Oz”, you know, with Dorothy, Toto and the Yellow Brick Road. The story focuses on Elphaba, the “Wicked” Witch of the West, and Glinda, The Good Witch of the North. As the official description says, “a lot has happened before Dorothy dropped into Oz”. I’ll leave you to find out what happens in the theatre. 😉 Pay good attention the lyrics of the songs, because there is a fair bit of foreshadowing. Performing at the Marina Bay Sands Grand Theatre is the touring production of Wicked, featuring the Australian Tour cast. While it is the traveling production, there is no compromise for this production at MBS when it comes to the stage props and installations – the extravagant scene design, moving props (with matching clockwork movement!) and of course, the Time Dragon, which moves during some critical points in the performance. The lighting effects for Ozdust Ball and Emerald City will definitely surprise and enthrall guests. It is a spectacle, so get your emerald glasses ready. We have here the updated version of Wicked, with the projection effects – No giant hat during the introduction, which was used for the Original Broadway production back in 2003. And possibly because of the way the MBS Grand Theatre is designed, this production omits the trapdoor at the middle of the stage, which is usually used for the traveler to disappear in “Have A Little Drink” and Elphaba to rise for “No Good Deed” – She simply walks to the center holding the Grimmerie. 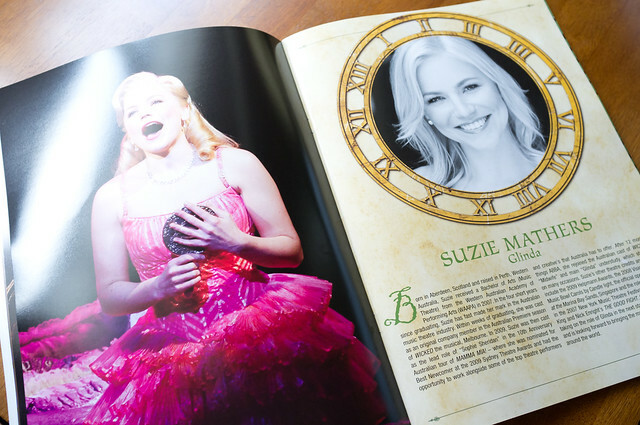 Update (8/12/2011): The role of Glinda is now performed by Lucy Durack (Glinda, Wicked – Australian Production) while Suzie Mathers recovers. Edit: Thanks to Lex, who noted that the Suzie Mathers was unwell last night and the understudy for Glinda, Allyve Martins, performed in her place (6th December 2011). It was a spellbinding performance. I particularly enjoy the vocals of Jemma Rix and Allyce Martins. While they do not sound like the Original Broadway Cast (which is what almost everyone wants), I find their rendition to be smoother, with that sweet harmony during duets. Don’t get me wrong, Kristen Chenoweth has a VERY powerful voice – she DEFINES Glinda, but she does get shrilly for the high notes. For Rix and Martins, their synergy at “For Good” was magically pleasant. 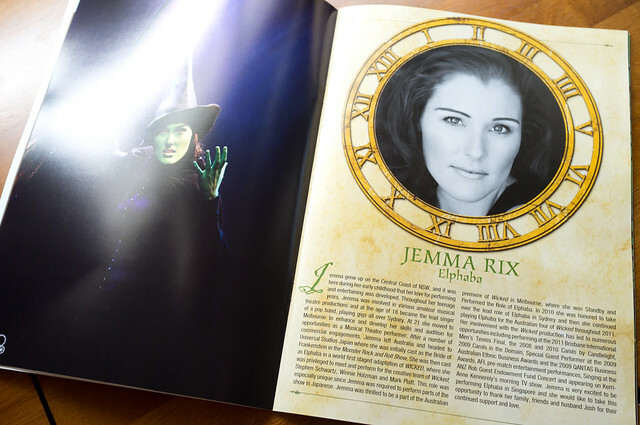 Jemma Rix is an expert in Wicked and well-known Elphaba around the world, having performed the role for many years and at many countries, including a stint at Universal Studios Japan. Keep your eyes (and ears) open during her spectacular solo, “No Good Deed”. Like I’ve said before, the stage design is extravagant and has a good deal of scene changes. There lights EVERYWHERE on the arches. The famous Time Dragon Clock backdrop and of course, the articulated Dragon prop – it’s all here. The Time Dragon Clock is significant in the original novel but not so much in the musical. To keep it simple, we are watching the show “through” the Time Dragon Clock, which is why we keep seeing the clock and its layers, and all the clockwork. It’s metaphorical, so I’ll leave you to find out what it is. The only thing that was off: some elements of the music messed up. Either the pre-recorded parts went on rapid loops during playback or the synthesizers went crazy at some points. A little disruptive, but at least it happened only during ensemble numbers and not during the ballads. Update (03/01/2012): I have watched a performance of Wicked with the role of Glinda performed by Suzie Mathers. She is an amazing Glinda and all I can say is – you must watch her perform on stage! The merchandise store is located at the entrance of the theatre (right behind the box office) and sells what you would normally see for touring productions of broadway musicals. There is nothing unique for Singapore, since the show is on tour. They have a selection of t-shirts, knit hats, track jackets, towels, a “Green Elixir” metal water bottles, lapel pins, keychains and lanyard. The Chistery plush toy goes for $40. The store is open to public at most times, but is closed to theatre guests only during the intermission. Most of the items sold at the store can be seen here: http://www.wickedthemusicalstore.com. Please arrive at the theatre on time, or better, at least 10 minutes early so you find your seats. There were a handful people walking in circles during overture, and it is just annoying to have someone in front of you waddling to their seats – you know how theatre seats have close to no legroom! Take note that the duration for Wicked is 2 hours 45 minutes: Act 1: 85 minutes, Act 2: 60 minutes and intermission: 20 minutes in between. Evening shows start at 7:30pm. Matinée shows start at 1:30pm. The Marina Bay Sands Grand Theatre has a very lax policy on punctuality (unfortunately) which means shows rarely start on time and the doors still remain accessible even when closed. However, once the performance start, the doors will not be open until the next appropriate pause in the performance… which happens to be during Dr. Dillamond’s class. This means that you would miss: The Overture, “No One Mourns The Wicked”, “Have A Little Drink”, “Dear Old Shiz”, “The Wizard and I”, “What is this Feeling?” – which is practically a third of Act 1. You think I’m being mean, but there were close to a hundred latecomers streaming into the theatre during that moment. Their lateness is just “unusually and exceedingly peculiar and altogether quite impossible to describe”. The theatre has changed their policy and late-comers will be able to enter the theatre during the speaking parts for “No One Mourns The Wicked”. For those who are thinking of buying tickets but not sure which seat class to book: I sat at the Stalls (near the back) and had an unobstructed view of the entire stage. My sister commented that it was too far to see the faces of the cast. We also could not see the entire parts of the inner dazzling arches of the set, because the outer-most proscenium arch is quite large and covers some of the inner layers. So… if you wish to see the stage in its entirety – the amazing “Time Dragon Clock” stage completely, and still have a good view of the cast, unfortunately you have to buy the expensive Emerald Class for the best view. Otherwise, the other seats provide a good view and enjoyable experience. Binoculars/Opera glasses are not necessary unless you REALLY want to see the cast’s faces. The souvenir program ($20) has a mix of photos of the Australian and American production. 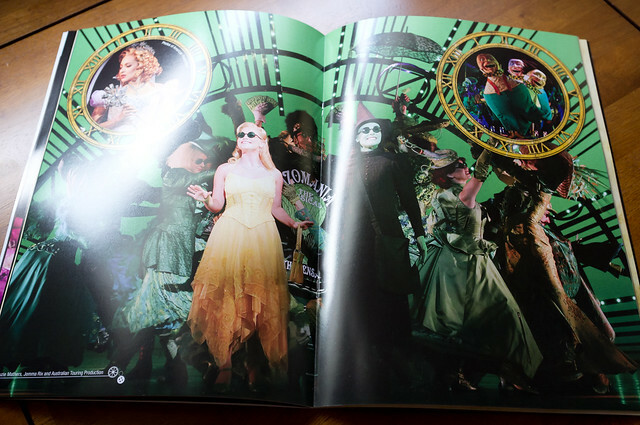 So yes, there’s some photos of Idina Menzel and Kristen Chenoweth (the riginal Broadway Elphaba and Glinda) inside. If you had the slightest intention to watch Wicked, please just go ahead to watch it. You will regret if you don’t. And oh, maybe watch The Wizard of Oz (1939) if you have time – some scenes will make more sense if you know some parts of the plot. We have so many interests in common….. I plan to watch this with my family when they come here to spend the Chinese New Year next month!!!!! Hi, I was there too last night 🙂 Such an amazing show! By the way, the role of Glinda was played by Allyce Martins (understudy) yesterday, not Suzie Mathers because Suzie was sick. Hopefully she’s ok for today! I had no idea! It wasn’t announced before the show and I didn’t see any notices anywhere. Allyce Martins was fantastic! I’m watching again next month and hope to hear Mathers’ voice then! Dejiki, hi! I’m an Australian fan and you definitely HAVE to hear Suzie’s voice. She has a beautiful voice, perfectly suited for the role of Glinda, as well as a beautiful personality! Hmm, quite a pity that opening night had to be covered by the understudy, but I suppose if one cannot detect it, then it’s a good sign; they are really good and the understudy does not jeopardize the chemistry between Glinda and Elphaba! Now i wish to hear them both, since it seems like Allyce Martins has some star power in her own right! So excited, and I hope MBS, or the audience does something about punctuality, cos I will stare down anyone who is late and affecting me, hahaha. Replacements happen all the time – I’m just surprised that the people at MBS Grand Theatre did not make an announcement. Like I’ve told you, the performance started immediately after the “gentle reminder”. 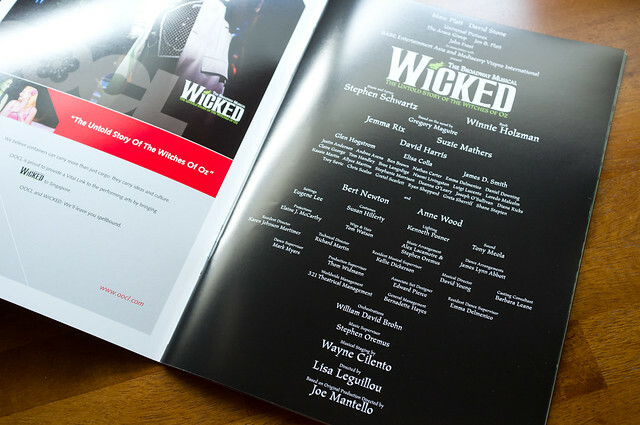 Yay I’m so happy I’m going to catch Wicked when I fly home with a friend…unless you want to watch it with me again LOL The souvenir program looks great too and I MUST HAVE IT. I think my sister wants to watch it again! She’s been listening to the cast recording like crazy (after watching). Why don’t we all watch it together? Hey, I was wondering whether the Stalls or Dress Circle is better. If its the stalls is it the left:right or centre? Dress circle seats give a less obstructed view (as it is on the second level), but depending on which row you are able to obtain, the stage might appear quite distant. As for stalls, centre would be the best as there are a lot of things going on during the performance – the left and right group of seats may obscure some parts of the stage, especially if you choose seats that are very near the stage (first 5-6 rows). I’ve sat at the first row of the dress circle before, so since I know what the dress circle is like, would the first row of Stalls Centre or first row of Dress Circle be better. An elaborate explanation would be MUCH appreciated. I would suggest Stalls Centre (A Reserve), which is directly behind Emerald Class seats. The stage has a lot of details so you’ll want to be able to see everything and at a comfortable distance. I’ve watched Wicked again from this area and I feel that it’s better than the last time (the seats were below dress circle then) because I was much closer to the stage. Personally I prefer Stalls level seats because I feel that higher-level seats, which gives the “top-down” view, reveals the stage floor which breaks the immersive feel of the show. In my previous comment, I said dress circle levels are “less obstructed” – Just want to clarify that I actually meant less obstruction from people sitting in front. As the Stall area slope is very gentle, the view might be obstructed by tall people sitting in front. And also, I saw that there’s a sound booth right in front of the Centre Stalls for A Res, will that affect my view? It shouldn’t, as there is a walkway between the soundbooth and the seats behind it – which have a greater elevation. Where did you sit in this blOg post? I would like to see the cast as well as the proscenium and staging. Does that mean I have to sit in the first row of the centre stalls? I sat at a B reserve seat (purple ones on the theatre seat layout). I had an almost complete view of the stage – with some minor obstruction. 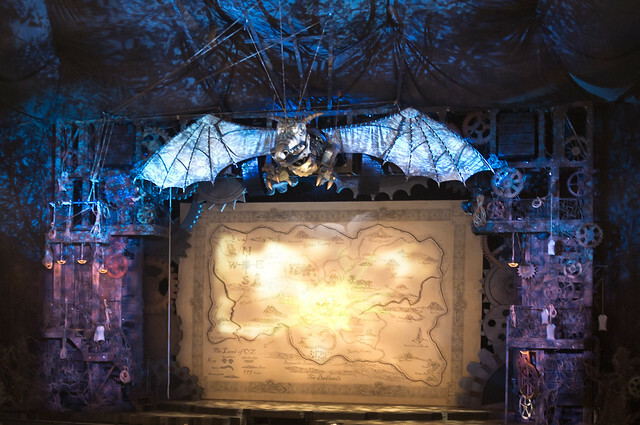 Take a look at the photo above – the proscenium arch and Time Dragon prop. Those parts blocked some high areas of the stage for me, but it’s very minor. If you are familiar with the show, it’s during “Thank Goodness” when two Ozians unroll the congratulatory banner for Glinda. They were standing on a very high catwalk, placed near the front of stage. So the Dragon and gears below it obscured some parts of that section – particularly the banner. When I rewatched again in a A Reserve seat, I was able to see everything. However, don’t be too concerned about this – I was able to watch the main cast throughout the show very well from my B reserve seat, including the finale to “Defying Gravity”. As for first rows or not, I would recommend that you take first row if you are able to get those seats. Better than having some very tall people in front of you (which you can’t control and really depend on “luck” for this) and have silhouettes of their heads in your face throughout the show. And do you think there will be a free seat upgrade for the last show? I really want my 2nd viewing to be the best as I’m going for the last show. Best to check with the ticketing office. From what I’ve seen with the previous seat upgrade offer, upgrades are specific to ticket purchases made during a promotional period. Hey, thanks for the replies 🙂 Another question though, do they sell the 5th Anniversary Special Edition Recording at the Theatre Boutique? I only recall seeing the original cast recording (in a jewel case). I remember that the 5th Anniversary Special Edition is in Digi-Pak format and nope, I didn’t see it at the boutique. Either I’ve missed it or it’s not available here. They have two albums by David Harris for sale, if you’re interested. Oh so you mean I should sit in the first row of the centre stalls? Again, sorry, but an elaborate explanation would be so appreciated, including the other questions above. I would recommend sitting at the first row of centre stalls behind Emerald Class (by the way, the rows I’m referring to are the A Reserve seats labelled 16 to 32, at rows AA to HH on the seating plan), so that you can enjoy a comfortable view as the next row of seats in front are quite far away, due to the walkway that’s right in front of the AA seats. If you are concerned that the soundbooth might be distracting (though they are using very dimmed displays), then get the aisle seats of that area. Oh and one last one ( I hope ), if I get Emerald seats, which row do I pick as when I check them, the first few aren’t usually booked. I can’t really help you here because I’ve not watched the show from an Emerald Class seat. Given my previous theatre experience, I personally prefer to sit at least 5-7 rows from the stage. Yes, you can get VERY close to the performers at the first few rows, but you’ll need to keep turning your head during some of the complex scenes. Besides, I think given how grand the stage is, you’ll definitely want to be able to see the entire stage at a glance! Anyway, a friend has informed me that the Theatre Boutique has both 5th Anniversary Special Editions and Normal Editions of the cast recording for sale. Oh thank you so much! How much is it by the way? A question, which seats are better? 3rd Row Stalls Centre vs. First Row Dress Circle? hello do you know if they are still selling souvenir programs? Mine got destroyed because of the floods. I’d pay any amount just to have one again. Unfortunately, no. Maybe try eBay or online forums. Hello, I know this post was years ago, but since Wicked is back at the same theater perhaps it might be relevant, but I’m looking to purchase tickets for the current 2016 Wicked show and wanted to buy the 1st row, center, stall seats (JJ), and was wondering if the hand rail is as high as the ones on the 1st row of the 2nd and 3rd floors? Will it obstruct a shorter person? Thanks!